Hardened thick dead skin on feet or hands is called Calluses and Corns. Generally, it is gray or yellow in color. Initially, it does not cause any pain. However, if untreated, it can grow deep inside and causes severe pain when pressured. It is normal for an active person to suffer from calluses and corns. 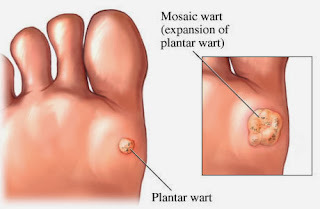 Below I have mentioned the main causes of corns and how I cure my corns. 1) It is caused due to pressure on the skin of feet or hand. 2) Friction or injury can also result in Calluses and Corns. 3) Pressure from footwear is the main cause of calluses and corns on the feet. 1) Avoid tight shoes, high-heeled shoes, loose shoes and shoes with a thin sole. In simple words, wear proper fitted shoes. 2) Avoid wearing sandals and shoes without socks. 3) Avoid exposing the corn to water. Treatment - Duofilm: Use this treatment during initial stage. When the corn is in initial stage, it is usually soft. 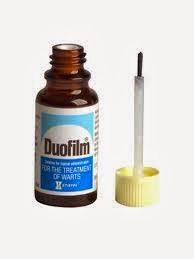 Apply Duofilm which contains Salicylic acid and Lactic Acid Collodion for the treatment of corns and calluses in the initial stage. Apply the liquid drops on the corn area twice a day. Leave for one hour after applying the liquid. After an hour remove the cream / surface created with the cotton slowly. If the corn is hard you need to apply the Corn Cure Cap which comes in two sizes. 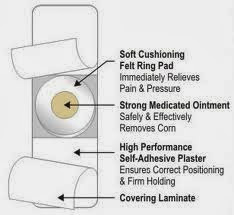 Corn cap is filled with ointment containing Salicylic Acid. Apply the same as per the size of the corn. 1) Clean the skin around the corn with hot water. 2) Dry thoroughly with the clean towel. This is most important to ensure adhesion. 3) Remove the release paper and position the foam case pad so that it surrounds the corn. 5) The corn cap should be left in the position for at least 4 days.